is much more than just a good meal. Back in August of 1965, Srila Prabhupada, the founder and spiritual master of the International Society for Krishna Consciousness (ISKCON), was crossing the Atlantic aboard the steamship Jaladuta. 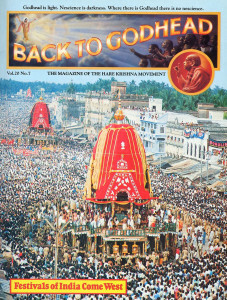 At that time there was no worldwide Hare Krsna movement. But Srila Prabhupada was crossing the ocean to carry the message of Krsna consciousness to the Western world. For days he’d been feeling seasick and dizzy, yet on August 20, the appearance-day anniversary of Lord Krsna, he spoke to the crew about Lord Krsna’s philosophy and fed them prasadam (food offered to Krsna) that he’d cooked himself. So it was that late one Saturday night in the fall of 1966, one devotee was stirring sweet rice in the small kitchen in the storefront temple at 26 Second Avenue, while others were frying samosas, kneading and rolling puri dough, spicing vegetable dishes, cutting apples for a chutney, making golden ghee-fried milk balls (called gulabjamuns), and working on some half dozen other preparations, all under Srila Prabhupada’s direct supervision. This was all in preparation for one of the first of ISKCON’s Sunday Love Feasts, and the devotees, who had advertised the new program in the Lower East Side neighborhood, were expecting about fifty guests. Word spread quickly about the exotic and delicious vegetarian feasts the Hare Krsna devotees were having. Before long, each Sunday the small temple room and courtyard would fill with guests eager to try the delicacies the devotees were generously serving. 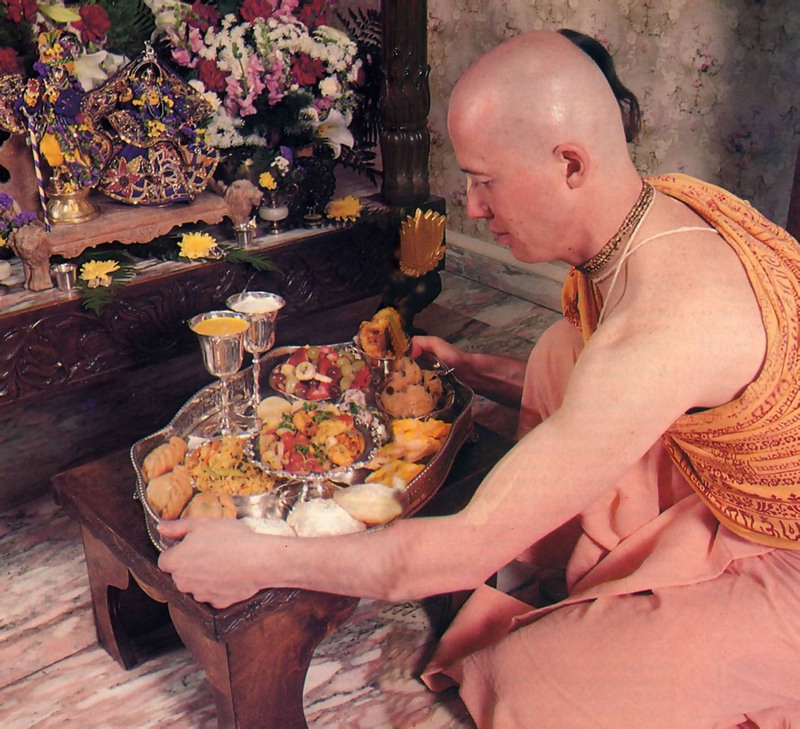 Over the years that followed, Srila Prabhupada opened many other temples, and in each one his Sunday feast program became a standard activity that continues today in the 175 Hare Krsna temples worldwide. We sincerely request you to visit us soon for an enjoyable summer Sunday evening. We’d like you to try the dishes we’ve made for Krsna’s pleasure. As you can see from the photo of Lord Krsna’s plate, we try to please Him with variety and opulence. As for the taste—that you can judge for yourself when you come. Perhaps it seems odd that we cook this extraordinary meal and offer it to God on His own silver plate before anyone else (including the cook) has tasted it. Actually, this is an important part of the science of devotion. God is not in need of anything from anyone; He is self-sufficient. Yet He eagerly accepts whatever His devotee offers Him in love. In other words, although God is the proprietor of everything and is full and complete in Himself, and although He is the reservoir of all pleasure, still His I pleasure increases unlimitedly (as does ours) when I we serve Him with love. The process of pleasing the Supreme is called bhakti, or service to the Lord with devotion. For those inclined toward philosophy, bhakti can be intensely philosophical; for those inclined toward activity, it can be most active. Bhakti can be as passive as hearing about Krsna, as arduous as fighting for Him, and as nectarean as caring for Him and feeding Him. To Lord Krsna, bhakti is the most important qualification a person can have. In the Bhagavad-gita (18.55) Krsna says, “One can understand Me as I am, as the Supreme Personality of Godhead, only by devotional service. And when one is in full consciousness of Me by such devotion, he can enter into the kingdom of God.” In other words, God is hungry not for our food, but for our bhakti. And in exchange for our bhakti, He gives Himself. The dishes that you see in the photograph, like all the dishes the devotees offer to Krsna, contain no meat, fish, or eggs. They, like the hundreds of thousands of other dishes we can offer, are made with combinations of vegetables, grains, fruits, milk, nuts, water and sweeteners. This is because Lord Krsna advises, “If one offers Me with love and devotion a leaf, a flower, a fruit or water, I will accept it” (Bg. 9.26). And why the silver plate? God, Srila Prabhupada has explained, is the original owner of all wealth. Whatever wealth we may have ultimately belongs to God, for He is its origin, its creator. A devotee, therefore, sees that all wealth should be used in the service of its owner, Krsna. So whatever wealth a devotee has he uses in the service of Krsna. If the devotee had the means, he would offer meals to the Lord on pure gold. Silver, after all, is still not quite the best. Please, come and join us for the Sunday Love Feast. It’s a transcendental experience we’d like to share with you.